I have already resolved to run fewer races in 2017; the Brighton half-marathon in the first quarter, and something equally challenging in each of the remaining three quarters. If you’d like to sponsor me for the Brighton Half, I’d be very grateful. I’m running for the Stroke Association. I have completed seven weeks out of sixteen of half-marathon training, and festivities meant that this week’s mileage was low, and consisted of only two runs, a Striders run on Wednesday, refreshed by satsumas served by the club captain on the way round, and ruled wine at the finish, and a return to Bevendean Down #parkrun in the company of Sweder. My companion had looked long upon the grape the night before, in the company of Seafront Plodder and other Seaford rakes. Yet, after a relaxed pace at first, at the top of the hill he opened the throttle and completed the course nearly four minutes ahead of me. I did win my age group though; truth to tell, I was the only VM60-64. I couldn’t take part in the Christmas morning Twitten run, but it went well, if Twitter is to be believed. My knee is still painful, but I think I have overcome my fear of damaging it through running when it hurts. And in the week ahead of me I have only three days at work, so more running become possible. 63 days till the Brighton Half. I’m running the Brighton Half for the Stroke Association. Find out more and sponsor me. on Friday evening, again a short outing in the evening, when I encountered Santa’s sleigh as it visits the streets of Seaford. today, the December event in the East Sussex Cross Country League at Newplace Farm. To know more about this, read on. Newplace Farm is a huge house and estate near Framfield. In mist and dankness, this race is cross-country as it should be, nearly five miles around the perimeters of muddy fields. It’s cross-country as it was in school, when the masters sent us out over frozen fields around Cambridge, while they sat in their cars, smoking, passing a hip-flask around, and speculating lubriciously about the trebles in the school choir. It’s challenging terrain, muddy, tussocky, but with no big hills. But the mud was nowhere near as bad as last year, and I was three whole minutes faster by my watch, though I await the official times. 70 days till the Brighton Half. This week I went back to running on Wednesday, having had ten days off running. I took it easy, with a mile and a half on Wednesday morning, two miles on Friday morning, and a bit over four miles today. My knee is painful, but I can run. What’s the point of keeping records if you don’t use them? I’ve been looking back at the past five years of running, to try to understand the history of my knee problems. What did I find? 77 days till the Brighton Half. Week four of training has been quiet, too damned quiet, Carruthers, becaase my knee osteoarthritis has flared up. I think this is a consequence of overdoing it at Crowborough. The next day it was swollen and painful, with lots of lovely crepitus. I swam on Tuesday, reasoning that this could do no harm, though kicking off on the turns hurt. But I have not run all week, and the pain comes and goes. I may try something on Wednesday morning, by which time it will be ten days since Crowborough. I'm not too discouraged, though the pain is a bore. In a sixteen week training programme, it's possible to lose a week or two to injury or illness. The important think is to take it slowly. 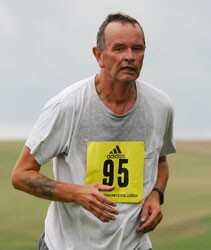 In other news, I was able to help with the Seaford Striders Mince Pie Ten Mile, by doing the results. From the race start, about ten minutes into the race, I looked out to the rear of the leisure centre towards the Peacehaven Centenary Park; in crips sunshine I saw a long line of brightly-clothed runners, a beautiful sight. 84 days till the Brighton Half.